Parents, grandparents, relatives and friends will create a wave of light across the world on October 15, when they light a candle for International Pregnancy and Infant Loss Remembrance Day, in memory of the brief yet meaningful lives of babies lost due to miscarriage, stillbirth and infant death. 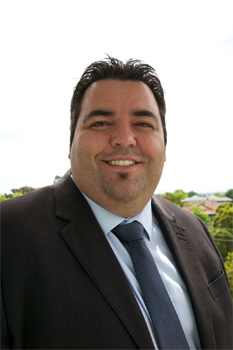 Andre Carvalho, CEO of Sands Australia, a not-for-profit organisation that offers support and guidance for bereaved parents who have experience the loss of a baby, says International Pregnancy and Infant Loss Remembrance Day is a day where parents can come together to support one another. 'This day is a very important one for the many Australian families who have experienced the grief caused by the death of a baby," he said. 'It's a day for reflection and remembrance, and it's also a time to help raise awareness among the greater community." 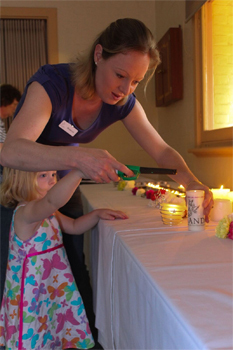 Each year, Sands organises a number of memorial events across Queensland, Victoria, South Australia, Western Australia and Tasmania, led by Volunteer Parent Supporters based in each State. 'This year, to coincide with International Pregnancy and Infant Loss Awareness Day, we will be hosting walks in in various locations in Queensland, Victoria and South Australia, as well as candle lighting ceremonies and memorial services in both Western and South Australia. 'We urge families, friends and members of the community to get involved. Join us for a walk or light a candle to show your support," Carvalho said. For mum and Sands Volunteer Parent Supporter, Ashleigh Rousseaux, who lost her son Dominic at 39 weeks pregnant, October 15, marks a significant day, and one she urges members of the community to stand behind. 'After losing our son Dominic, we used the opportunity of Pregnancy and Infant Loss Remembrance Day to announce his birth and death. It's a day that holds a very special place in our hearts. 'For those people who have experienced or been touched by a loss like ours, we urge you get involved with your local event or light a candle at home. It's a wonderful way for the community to come together and show their support for those who need it," she said. 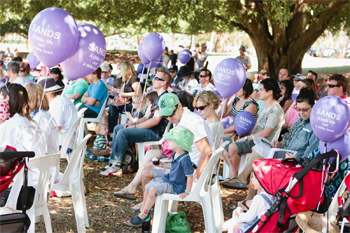 To learn more about Sands Walks and Memorial Events, visit the Sands website at http://www.sands.org.au/latest-news/336-sands-walks-2016-locations-announced. Question: What do you hope to achieve this International Pregnancy and Infant Loss Remembrance Day? Question: Why do you believe many parents feel the need to keep their infant loss experience quiet? Andre Carvalho: Unfortunately there is a often still a wall of silence surrounding miscarriage, stillbirth and newborn death. It is not something we talk about openly in society. This means that the community at large often don't really have a full appreciation on its impact on parents and families. Our society often expects parents to get 'over it quickly and move on", without understanding the devastating impact for many parents and of the significant grief that will be experienced. This lack of understanding can result in parents feeling isolated and lonely, because they feel that their feelings are not acceptable in public. Question: How can we remove the taboo associated with infant loss? Andre Carvalho: We need to talk more about pregnancy and infant loss. The death of a baby during or after pregnancy is a major bereavement. Preparing for the arrival of a baby is usually a happy and exciting time, however when a baby dies, this joy comes to a shocking and usually unexpected and possibly traumatic end. The death of a baby is deeply personal and everyone responds differently. We need to talk more about it so that as a society we are able respond in a more understanding and compassionate manner and so that parents feel confident in opening up to friends and family. Question: How can we support friends and family who have lost an infant to still birth, miscarriage or neonatal death? Andre Carvalho: What we can do to best support friends and family is by simply being there for them and letting them know we understand what a huge loss they may be experiencing. We can convey that we care about them, that we are there for them and invite them to tell us what support they'd like from us. They may not know what support they want or need, but we can reassure them that we understand their need to grieve in their own time, in their own way and we are there for them. Sometimes sitting silently alongside someone who has no words to express the magnitude of their grief, - simply -being there' can be really powerful support. Question: Can you share with us some things to say to family who have lost an infant? Andre Carvalho: 'I know there's nothing I can do to fix this but if you just want someone to talk to, I hope you know that I'm here whenever you need me"
'I know how much you wanted this baby"
'If you don't want to talk that is perfectly okay. I'm happy to just sit here with you"
'You are not going crazy, you are grieving"
'It's not your fault, you didn't do anything wrong"
'I can't imagine what you are going through"
'is there anything I can do to help you"
Question: What things are not helpful to parents? 'It was for the best - something must have been wrong with the baby" This may cause added stress in future pregnancies or make the parents feel that there must be something wrong with them. 'You're still young, you can always have another" No one can guarantee that the parents can conceive or have another baby and if they do it will not make things better for them and will never replace the one that died. Babies are not replaceable, this baby was a loved and wanted. 'Maybe it's all for the best" Best for who?? Surely not the baby or their parents. 'You will soon get over it" No, the parents will not get over it, they will get through it. 'I know how you feel" Even if you have also had a baby that died, the parents grief is unique. Question: And, what signs should friends and family look for in parents who may need professional help? Andre Carvalho: This is a very difficult question to answer as each of us grieve in a unique and individual way and what one person may see as being -complicated grieving' that requires professional intervention may be viewed as perfectly normal by another, particularly across cultures. If we seek to ensure that bereaved parents are supported in their grief and are aware of a number of support options they can access, should they choose, (be they informal and/or formal), most will be able to navigate their own grief journey, in the timeframe and manner they need to. Question: How can Australians support Sands Australia? We at Sands are working hard to ensure that all bereaved parents across Australia have access to support and information following the death of a baby. All our Parent Supporters are volunteers who have been through the experience of losing a baby themselves, so they understand the heartbreak and devastation that follows the death of a baby. In the last 12 months, we experienced a staggering 40% increase in the number of parents, families and healthcare professionals accessing our services. Being a volunteer-led not-for-profit, we can't do it on our own. We need to grow our community of donors and supporters to continue to meet this demand. You can support us by donating to Sands at www.sands.org.au/donate. With your financial support we can do what most people can't. Be there, any time, with the right guidance and comfort than can only come from personal experience.